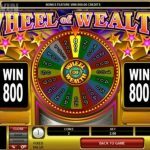 Wheel of Wealth is a classic slot from Microgaming that is far from being a simple game thanks to the many special features that it offers. 3 reels and 1 pay line is the perfect combination for nostalgic players that enjoy simple play and big wins. Microgaming has gone one step forward when they have created this game and brought to us a slot that is simply amazing. Simple game play, a sprinkle of Las Vegas glitz and glam, and some fruitful winnings is all we need when we play online slots. This game has a very simple classic look but offers a different game play, thanks to its special symbols and features. 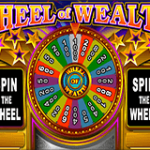 The Wheel of Wealth icon is the wild and its only function is to substitute for all the other symbols to complete a winning combination. What is more, if one wild completes the winning combination your win is a subject to a x 2 multiplier and if 2 wilds complete the winning combination your win is a subject to a x 4 multiplier. The wild cannot substitute only for the scatter. The “Spin” symbol is the scatter and it appears on the third reel only and when it does it activates the Wheel of Wealth bonus feature. You need to spin the wheel and reveal your prize. There is only one condition to this feature, you need to place maximum bets only. 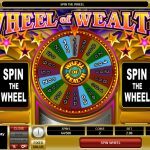 Microgaming has done a great job creating Wheel of Wealth slot. Having in mind both nostalgic players who enjoy 3 reelers, and new players who like special features. These kinds of games are usually overlooked nowadays, which turns out to be a huge mistake since they can pay really good. Want something a little different? Well aliens are definitely just that so try playing What On Earth a 5 reel slot by MicroGaming.